If you've been feeling skeptical about DJ Hero thus far, watching these songs - including MC Hammer's "U Can't Touch This" vs. Vanilla Ice's "Ice Ice Baby" - played on Expert might just win you over. Unfortunately, the videos in question don't seem to be embeddable, so you'll have to manually head over to the Official Nintendo Magazine UK site to check them out. 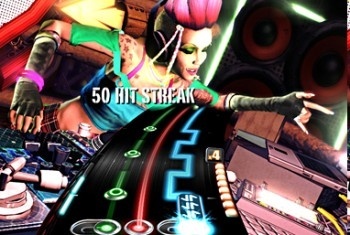 ONM's Chris Scullion tackles three DJ Hero songs on Expert difficulty, and I must say that the game is actually looking much better than I'd given it credit for so far. Part of it is the music. Oh sure, it's no "Bark at the Moon," and rocking out like a superstar has an appeal all to itself that DJ Hero just can't quite capture, but the three mixes we hear in the videos are actually rather well done. We have Gwen Stefani's "Hollaback Girl" vs. Rick James' "Give It To Me," The Killers' "Somebody Told Me" vs. Eric Prydz's "Pjaano," and last but certainly not least, MC Hammer's "U Can't Touch This" vs. Vanilla Ice's "Ice Ice Baby" in a stellar blast of nostalgia from the early 90s. The gameplay looks a lot more interesting than I'd been expecting, too. This is on Expert, so it can seem a bit overwhelming at times (how are we supposed to move both hands at the same time? It's impossible, I tell you!) but it also looks kind of fun. The sampling, the scratching, the cross-fading - it's all there, and we even get a look at the Rewind and Euphoria features once or twice. All in all, these videos have actually sparked a bit of interest in DJ Hero for me. Didn't see that one coming.